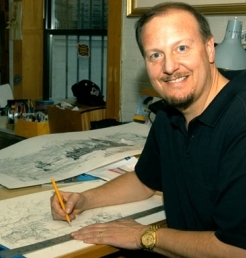 Charles Fazzino, graduate of the School of Visual Arts in New York City is one of the most popular and highly-collected pop artists of all time. During his more-than-thirty years as a pop artist, he has inserted his unique, detailed, vibrant, and three-dimensional style of artwork into the very fabric of popular culture. Fazzino’s artworks are exhibited in hundreds of museums and galleries in more than twenty different countries. He has received many private and important commissions and has been selected as the official artist for festivals and events all over the world. Charles is often referred to as a pop culture historian because of the breadth of his work and the way it touches his collectors and captures the best parts of their contemporary lives. His legacy will mark him as part of the next generation of famous pop artists as he follows the paths originally forged by pop art pioneers such as Andy Warhol, Keith Haring, Red Grooms, and Roy Lichtenstein.